In qualitative marketing research, projective techniques explore associations with brands, symbols, products, advertising, and images. It explores people’s subconscious feelings, beliefs, and desires. Respondents project their feelings and beliefs about other people or objects. In doing so, they reveal feelings and beliefs about themselves. With sensitive subjects, the technique works well. Here are four practical and simple techniques. This is not an exhaustive list. A metaphor represents or explains something in terms of another. Metaphors explain complex or new subjects [target domains] by using a familiar subject [source domain]. Metaphors are a window to the mind. The purpose of understanding metaphors is to understand people’s mindset and feelings about something. Most importantly, metaphors can reveal underlying emotions about a target domain…such a product or brand. And, one can infer whether emotions are positive, negative, or neutral. You can use the results from metaphor techniques to develop advertising, brands, sales pitches, and to support product or brand positioning. Here is a simple sentence completion exercise using similes. Ask respondents to complete the sentence. Here are some results at the category level for cell phones. “A cell phone is like my wallet. I would never leave home without it. The results show cell phones are a necessity for a segment of consumers. A minority find them annoying. Besides sentence completion, you can also ask respondents to associate a product or brand to pictures and images. And, you can ask them to draw pictures. Another way to elicit metaphors is to ask respondents to complete storyboards. Look for metaphors, analogies and similes. Think about what feelings and emotions they reveal. Judge if they are positive, neutral or negative. With this technique, you ask respondents to describe what other people are doing, thinking, feeling, believing, and saying. Ask respondents to project to a third-party. Ask follow-up questions and probe answers, using the third person. Use third-party projections for sensitive subjects. In other words, when people hide or deny their real thoughts, feelings, or beliefs. You ask respondents to assume a role and act the part. It is a variant of third-party projection. Use role-playing when asking for product or advertising recommendations. You ask respondents to link a word or image to a category, product, brand, or event. Then ask how the association ties to the topic. You get people to bind one concept to another. Often associations produce metaphors, analogies, and similes. Some association techniques include word associations, imagery associations, and personifications. Provide a prompt in the form of a word, phrase, or sentence and ask respondents to associate something with it. Show people an image, or ask them to bring or select an image. Images are pictures, drawings, or illustrations. Then, ask people to describe the image. Ask how it links to a product, brand, object, or person. Also, ask the respondents to imagine an image and describe it. Ask several follow-up questions about how the association relates, and probe to clarify. Personification asks respondents to give human characteristics to products, services, or brands. Personification is fun. The challenge of personification is interpretation of data and analysis. Use associations to understand imagery and stimulate memory recall. Some advanced techniques include the Rorschach Inkblot Tests and Thematic Appreciation Tests. Projective techniques have their roots in psychoanalytic psychology. Several psychoanalytic theories abound. The more advanced techniques require training in application and especially in analysis. Analysis of sophisticated techniques involves judgment based on training an experience, and is often open to interpretation and debate. In product or service marketing research, laddering works well as technique to identify how people perceive functional and emotional benefits of a product or service. The advantage of laddering is it clearly links specific product features, benefits, and emotional benefits together. People buy product features, functional benefits, high order benefits and emotional benefits. They are primary drivers of wants and needs. Use projective techniques to complement laddering. Use practical projective techniques in focus groups and depth interviews to gain new perspective and to dig into underlying feelings and emotions. 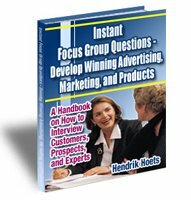 Instant Focus Group Questions e-book is packed with hundreds focus group questions, including projective techniques. The e-book is a practical handbook about qualitative marketing research, with tips, techniques, and questions you can use. Click on the e-book to learn more now.